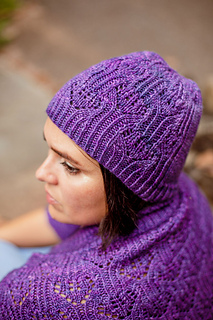 A simple shape with a twisted-rib brim and a romantic, floral lace panel, this hat is quick to knit and easy to wear! Designed especially to show off the lovely hues and smooth texture of Blue Skin Yarns Steinbeck, an enticing blend of Merino and Cashmere with a touch of Nylon for durability, the Climbing Roses Hat is a complement to the Story of Lilla Collection, the brainchild of dyer and author Debi Martin, who pairs each pattern with a chapter in the intriguing love story of a princess named Lilla. Read more about it here! 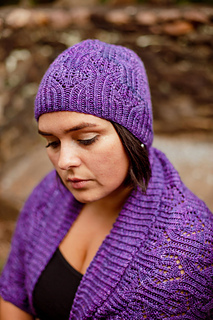 No purchase is necessary for this hat pattern, but I encourage you to pair it with a skein of Debi’s delicious hand-dyed yarn and check out the other patterns in the collection! Read along, knit along, and enjoy the beautiful yarn! Looking for the matching shrug? That’s over here!